At St Clair Dental, our dental team is highly skilled in extracting teeth gently, carefully and efficiently. We only remove teeth when no other solution is available and keep you comfortable with sedation throughout the procedure. If you’re in pain or unsure if you need to have a tooth removed, we’d be happy to consult with you and determine whether it’s required. 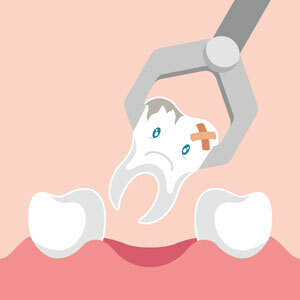 When a tooth can’t erupt because its path is blocked by a tooth, soft tissue or bone, it’s referred to as impacted. It can cause swelling, pain, bad breath and more. We’ll take an X-ray to determine the placement of your wisdom teeth. We can handle most cases, though you’ll be referred to a specialist if your case is complex. Once we evaluate how best to perform the extraction, we’ll proceed with this minor surgical procedure, which lasts for just 20-45 minutes. If needed, you’ll be given antibiotics or anti-inflammatory drugs to fight off infection. The removal is performed while you’re under local anaesthesia, keeping you at ease the entire time. You’ll return after a week to have sutures removed. Please keep in mind that there are risks associated with any surgical procedure. In this case, you may experience pain, bleeding, swelling or infection. To reduce swelling, apply an ice pack wrapped in a towel to the area. If bleeding occurs, bite down onto clean gauze with pressure. Stick to eating soft foods and drinking plenty of liquids. Teeth should be brushed with gentle strokes in the days following your surgery. If medication is prescribed, take as advised and follow all other instructions. What can we do to improve your smile? Learn more about extractions and wisdom teeth in Woodville by contacting our team today! We’re providers for Bupa, Medibank, HCF and CBHF.